Toddler Loft Shown. (This model is larger and higher to accomodate older toddlers.) See dimensions below. This Adventurer Older Toddler Loft from Strictly for Kids adds fun and imagination to any daycare center or preschool environment. 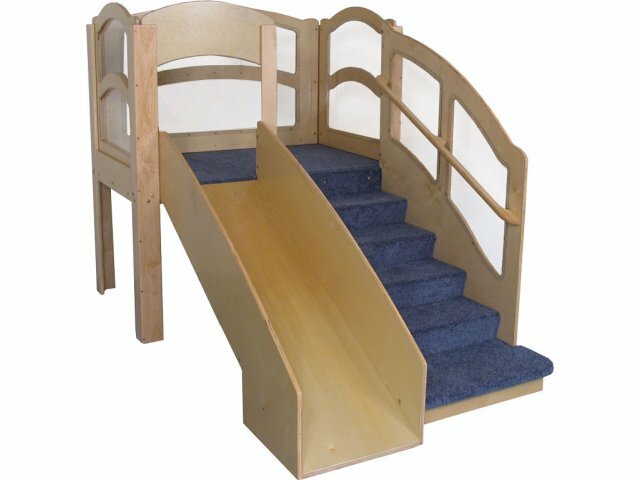 Specifically for older toddlers, this play loft features extra-deep steps with handrail, a slide and a play space below that allow young children to develop gross motor, turn-taking and imaginative play skills while having fun. Baltic birth plywood construction provides stability and strength, and indestructible Lexan windows keep children in full view of caregivers at all times. Steps and deck are fully carpeted. Ideal for ages 24-42 months. Sturdy: Constructed of Baltic birch plywood for sturdiness and durability. 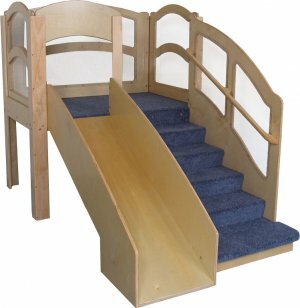 Safe: Extra-deep steps, handrail, fully sanded and rounded edges and safety barrier on slide keep toddlers safe. Indestructible: Lexan windows keep children within constant view and provide shatterproof security. Fully Carpeted: Stairs and deck area are fully carpeted. Builds Gross Motor Skills: Encourages infants and toddlers to explore while building gross motor skills like crawling, climbing and balance. Facilitates Social Interaction: Slide and play space encourage children to interact and engage in imaginative play.